We've all heard the advice: "Keep it simple, stupid." The myriad features sewn into every piece of equipment are fun, but do you really need all that? Probably not. Dainese proves that all the flash and flare doesn't replace a well-made leather glove. 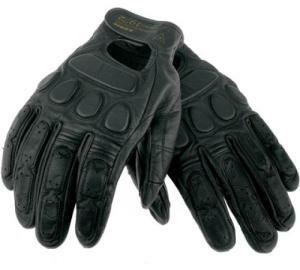 The Black Jack gloves are goatskin with reinforced palms and an adjustable cuff strap. There are a few riding-specific perks, such as soft leather-covered inserts over the protrusions of the rider's knuckles, the back of the hand, and the heel of the thumb. These inserts protect your tendons and bones from impact, pressure, and fatigue. If you know anything about the anatomy of the hand, you know there are a lot of little bones and tendons with intricate, hard-to-repair architecture. So keep them safe. Reinforced, perforated panels on the fingers will give your hands some breathing room and a little extra padding if you need it. Because most of your grip comes from your index and middle fingers in collaboration with your thumb, Dainese put elastic inserts at the base of each finger to permit full range of motion. The simplicity of the Black Jack glove makes it an unobtrusive addition of high-quality black leather with a few extras. Dainese knows it's hard to go wrong with the classics but, as well as the black, they offer their Black Jack in yellow or red, both colors with a worked-in dusty and faded look.